Lately, college football has adopted its older brother's affection for corporate naming rights and big-money network contracts. This makes sense, of course, since history has taught us that where capitalism goes, football follows. The well-fed feast on the average, greedily outspend each other for the top spot, and then blame the system when the whole thing ends controversially. But look hard enough, and you can still spot some endearing vestiges on college football's softer underbelly. Take matchup nicknames, for example. The Michigan-Ohio State game, considered one of the greatest sports rivalries, has donned the simple moniker "The Game." There are a couple of Ivy League schools that claim ownership of that nickname, too, but no Crimson-Bulldogs game has ever packed Harvard Square quite like they can in The Big House or The Horseshoe. Another wonderful college football tradition is travelling trophies. Like the Jeweled Shillelagh, which is awarded to the winner of the Notre Dame-USC game. It's a stick with jewels on it! Oops, wrong picture, here's the right one. get it?) is the trophy's inexplicable physical form. It's a wooden turtle. Believe it or not, these only begin to scratch the surface of charmingly weird rivalry traditions. 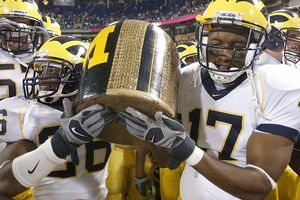 AP Photo/Tom Olmscheid Michigan and Minnesota compete for the Little Brown Jug, the oldest rivalry trophy in college football. • The Little Brown Jug: Michigan vs. Minnesota. It's the standard-bearer by which all other trophies are judged. 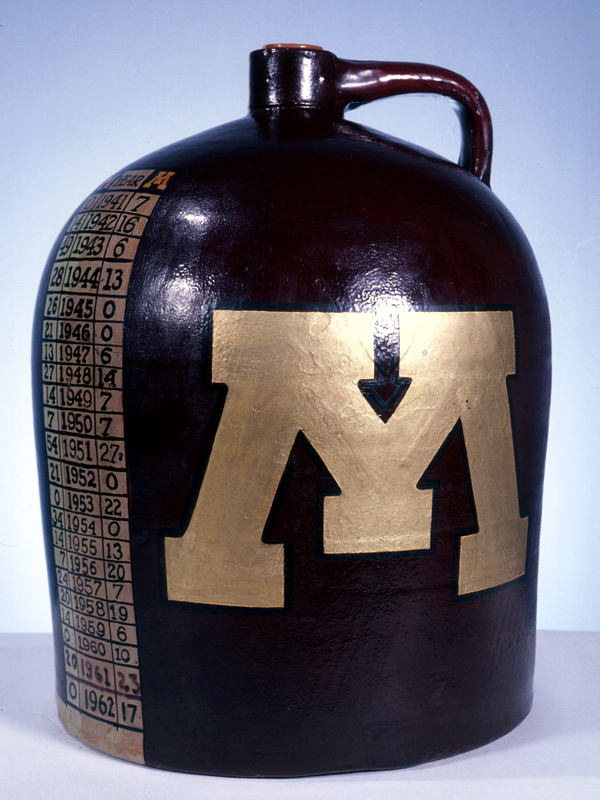 After purchasing a 30-cent ceramic jug to ensure Minnesota didn't contaminate his players' water, Michigan head coach Fielding Yost requested it be mailed back to him after accidentally leaving it behind following an epic 6-6 tie between the two rivals. Minnesota's AD L.J. Crooke simply replied: "We have your little brown jug; if you want it, you'll have to win it." Tradition was borne. • The Egg Bowl: Ole Miss vs. Mississippi State. • The Slab of Bacon: Wisconsin vs. Minnesota. (It's a "W" or an "M," depending how you hold it!) This trophy is actually out of commission now, and has been replaced by Paul Bunyon's axe, which -- somewhat incredibly -- feels like a downgrade. • The Apple Cup: Washington vs. Washington State. It would appear football fans enjoy breakfast statuettes just as much as the next guy. Note, too, the regional diversity of these rivalries. Simply put, Americans love food, football and artwork honoring their love of food and football. In this country, we all hate our rivals, and like to chow down while we do it. Beautiful, really. So, it's only fitting that our national meal -- a pigskin scramble with a side of pride and a cup of pageantry -- should earn deep-fried treatment in the great state of Texas. • The Iron Skillet: TCU vs. SMU. The following pair of corresponding rivalries is still awaiting official approval, but it should only be a matter of time now. • The Cream Puffs: Florida vs. Florida International AND Alabama vs. Chattanooga. This nickname is still awaiting official approval, but c'mon! It might be standard operating procedure to schedule these games at the beginning of the season, but now? If the SEC championship game will be the cinematic climax we've all been waiting for, then these games are akin to a three-hour Freedom Tray infomercial. • Keg of Nails: Louisville vs. Cincinnati. It's a real keg, but no word whether it's actually filled with nails or something more befitting a college tailgate. But for those who don't always clean under their fingernails or take their beer with a coozie, there's still hope. • The Old Brass Spittoon: Indiana vs. Michigan State. If you dress even half as nicely as you would for the World's Largest Outdoor Cocktail Party centered around the Florida-Georgia game, just keep an eye out for the guys who didn't bring their own spittoons. Matthew Iles is an editor for ESPN.com.